How many team members are required to run an ECMO CPR? Our ECPR process was designed using a simulation-based development program. This program involved repeating the ECPR process multiple times over a number of weeks and refining each step along the way. One of the main components in this process was to determine the number of personnel that would be required to undertake an ECPR event and importantly to determine the exact role each member would perform as part of the team. Finally, the 11th role is the Team Leader. This role is complex and involves running the arrest as well as co-ordinating the actions of both the ALS and Cannulation teams. Secondly, they are designed as an aide-memoire. Many of the cards include information for the team member on what their role involves and equipment that they are required to collect. Thirdly, the layout of the cards are designed to represent the layout of the resuscitation room. 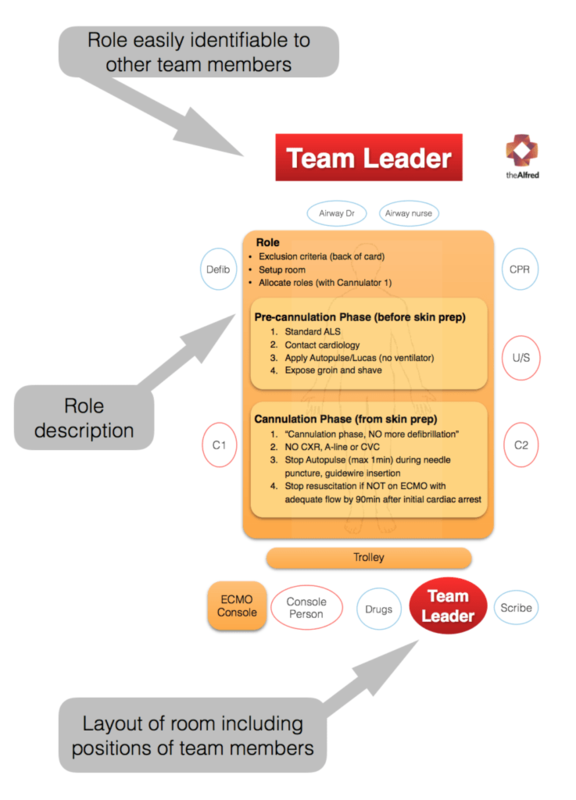 Positions of team members are identified which enables a standardized approach to each E-CPR case. The Team Leader and Cannulator 1 role cards also include the exclusion criteria on the reverse side of the card. During the simulation process we determined that the decision to proceed with cannulation needed to be made primarily by these two team members. The E-CPR cards are stored in the box allocated to canulator 1 on our ECPR trolley. The ECMO roles have the role identified on one side and the cognitive aid on the reverse.